Jean Nouvel, Rem Koolhaas, Bjarke Ingels and Norman Foster – all these cutting-edge architects have at some time used comic strips to present their projects or reflected on the socio-political context that shaped them. 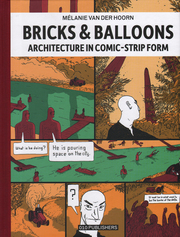 'Bricks and Balloons' brings together a wealth of architectural projects that reach out to the world of comics, many published here for the first time. The book is based on first-hand information collected during dozens of interviews with architects and comic strip artists.